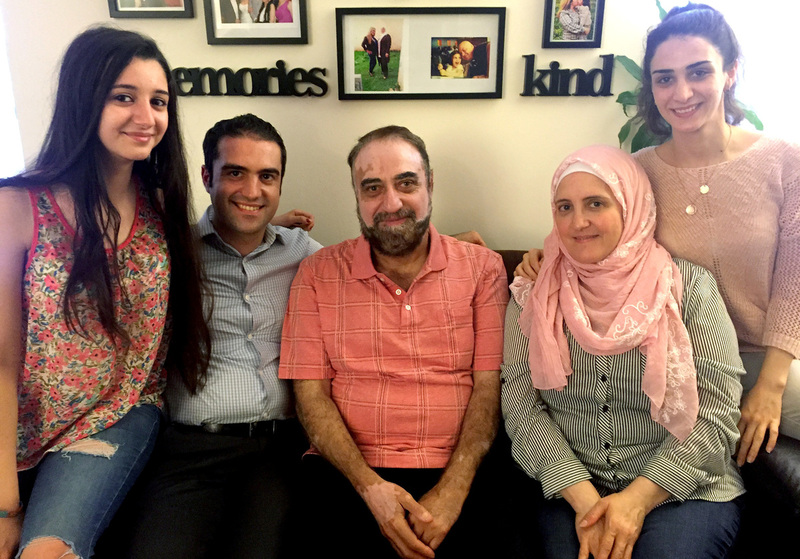 Almothana Alhamoud (second from left) with his family in Chicago. From left to right are his sister, Fatina; their father, Abdel Bari; their mother, Alia; and his other sister, Rowan. Alhamoud earned a computer engineering degree in Syria, but when he came to the U.S., he initially worked as a cashier. The group Upwardly Global helped him find a job in IT. When Almothana Alhamoud, a 31-year-old Syrian data analyst, arrived in Chicago two years ago after fleeing the Syrian war, he jumped at his first job offer, a nightshift cashier at a convenience store. "When I came over here I just want to find anything to survive," he says over dinner with his family in Chicago. His parents and two sisters fled Damascus six months after he did. The family has applied for asylum in the U.S.
Alhamoud has a bachelor's degree in computer engineering. His career as a data analyst for Syria's Agriculture Ministry was cut short by the war. In job interviews in Chicago, he struggled with English and discovered his Syrian degree was not recognized. He feared he would have to get by in low-wage jobs. "It was cold and it was the worst winter I ever seen in my life. I was struggling there," he says, now looking back. According to a new report from the Migration Policy Institute in Washington, nearly 1.5 million college-educated immigrants were employed in low-skilled jobs between 2009 and 2013. Nearly a third of refugees resettled in the U.S. in the past few years are college graduates. It's a common story, the taxi driver who was a surgeon back home. The Migration Policy Institute researchers call it "brain waste." The institute's president, Michael Fix says it represents a huge loss to the U.S. economy in squandered potential. These workers, he says, "lost 40 billion dollars a year, or about the same amount as the entire profit of the airline industry." He adds that the increase in income would translate into nearly $10.2 billion more in federal, state and local taxes. In Chicago, Alhamoud took note when a family friend posted an article about Upwardly Global on Facebook. It was his introduction to a nonprofit based in New York that helps immigrants and refugees rebuild their careers. Alhamoud quickly signed up and went to job workshops in Upwardly Global's Chicago office. He was assigned a mentor, a volunteer, who helped him fine-tune his resume, and practice his interviewing skills. After seven months of workshops, Alhamoud found a job with Cox and Kings Global Service. He's an IT help desk support technician for a company that processes visas for the Indian consulate in Chicago. "To learn to sell yourself, that's the hard part, it's the work culture thing here," he says. Now, he plans to spend his nightshift as a student, seeking an advanced American degree. 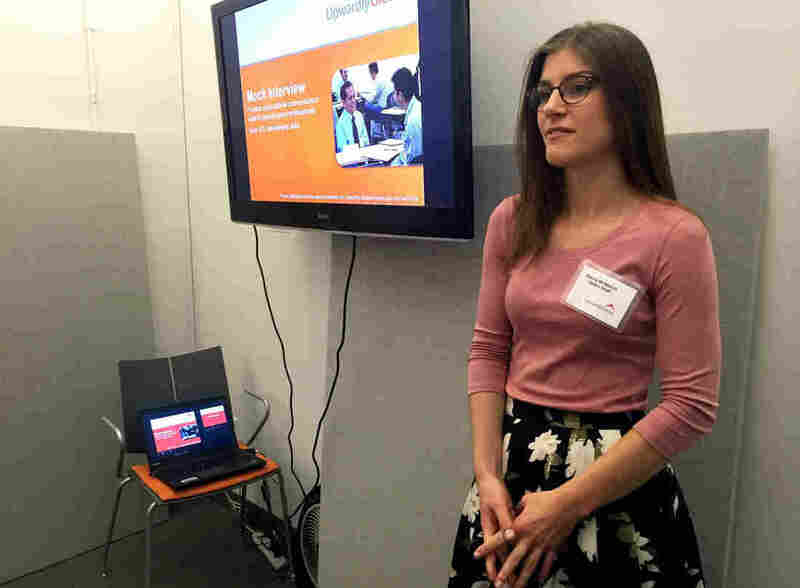 Over the past decade, Upwardly Global has successfully placed 3,700 applicants in their first professional positions, says executive director Nicole Cicerani. "Average starting salary somewhere between 45,000 and 50,000 dollars," she says. Still, there are barriers to professional employment, especially for refugees. There are gaps in resumes, work histories disrupted by years in a refugee camps, missing college records left behind in the chaotic rush to escape a war zone. So Upwardly Global identifies talent for private companies looking for skilled workers. Cicerani partners with big names from the Fortune 500, like Wells Fargo and Accenture. "In all of our employer partnerships, nobody has agreed to hire our candidate. They agree to interview them and they hire them because they wind up being the best candidate for the job," says Cicerani. "That's really something when you think about it – the top candidate was somebody who was working as a hot dog vendor six months prior." Upwardly Global is breaking some of the barriers to professional employment says Margie McHugh, director of the Migration Policy Institute's National Center on Integration policy, the first to map profession by profession the training and licensing requirements for pharmacists, dentists and doctors. Upwardly Global, she says, "not only saw that there was a problem, they rolled up their sleeves to begin addressing it." U.S. business has started to recognize that immigrants and refugees are a talent pool. U.S. cities are also developing programs in recognition that economies can benefit from newcomers that bring entrepreneurial and professional skills. St. Louis, Cincinnati, Detroit and Pittsburgh are starting to reach out. The Mosaic Project in St. Louis replicated the Upwardly Global model matching immigrants with skilled professionals to improve job opportunities. While political leaders have described refugees as a threat and a burden, Cicerani insists this population is a talent pool. The motivation necessary to get through the refugee resettlement process, that can take years of interviews and security clearances, is the same motivation they bring to the workplace. "We talk a lot about a physician from Iraq who was an orthopedic surgeon," says Cicerani, who worked as a hot dog vendor when he first arrived and now has a job in medical research. She says that one more barrier is the American narrative for immigrants and refugees that "come to this country and sacrifice everything for the next generation," including their education. "This is a postindustrial, skills-based economy and the idea is that we want people to do the jobs that we actually need in our economy," she says.